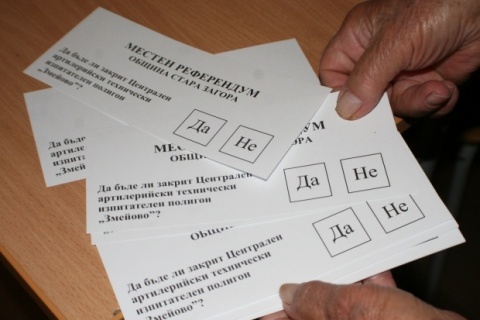 Citizens of the southern Bulgarian city of Stara Zagora go to the polls Sunday in a local referendum on the future of the Zmeyovo artillery practice range. Residents of Stara Zagora are to answer the question "Should the Zmeyovo artillery practice range be closed?" according to reports of dnevnik.bg. The local referendum is organized on the basis of a decision of the Stara Zagora municipal council triggered by mounting fears of locals of the air pollution caused by the Zmeyovo artillery practice range. The funding for the referendum is provided from the municipal budget. The air quality around the Zmeyovo artillery practice range has been monitored round the clock since 2008, when two automatic control stations were mounted. According to statistics presented by caretaker Environment Minister Yulian Popov and caretaker Defense Minister Todor Tagarev, air pollution levels in Stara Zagora are much lower than in Sofia or Pernik, for instance, and the artillery practice range and the gas pollution in the city are unrelated.